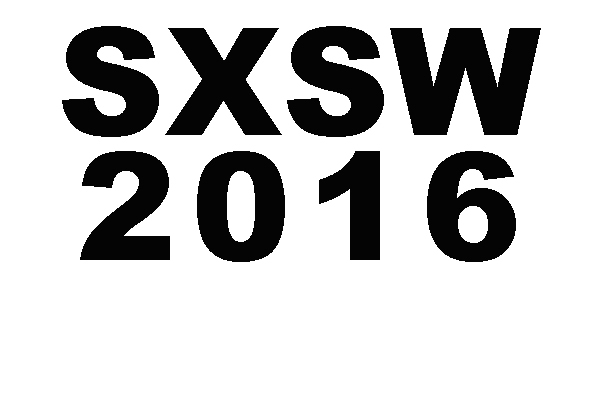 Please join us at the Saxon Pub on Thursday March 17, 2016 at 8pm for the Official Saustex SXSW Showcase. 21+, Badges, Wristbands, Single admissions at the door. This year's event will feature the first ever SXSW appearance of Timmy Thomas (backed by the Overtown Soul Revue). Soul legend Thomas, who serenaded the world in 1973 with his million-selling smash "Why Can't We Live Together," has conquered the world again. Thanks to Drake's beyond-obvious sample of "Why Can't We Live Together" in his monster worldwide hit "Hotline Bling," the world is dancing yet again to Timmy Thomas' groove. NPR profiled Timmy and testified to his classic hit's staying power and relevance in 2015: "Timmy's song resonates now more than ever-ever..."
2016 will find Timmy Thomas releasing a new album for Overtown Records/Saustex Media titled "Wings Of Change", and we'll be handing out some advance CD singles of tunes from the new full-length at the show. Next up on the bill will be Javier Escovedo backed by the City Lights Band, his personal a** kickin' wrecking crew. The founding member of The Zeros and The True Believers has been racking up great reviews and feature articles with the 2016 release of his second solo album "Kicked Out of Eden" on Saustex Media. Following Escovedo will be Louisiana vets and SXSW perrenials Dash Rip Rock. The New York Times says Dash Rip Rock combines "fluency in American roots music with a robust dose of punk-rock spirit." SPIN praised Dash Rip Rock as "undeniably the South's greatest rock band." In 2012 Dash Rip Rock was honored to be inducted into the Louisiana Music Hall of Fame. Band guitarist, singer and songwriter Bill Davis has soldiered on through numerous lineup changes and is the heart of DRR. The band also holds the distinction of being the only act to play almost every year of SXSW. BP Fallon takes the stage at 11:30 -- not sure yet exactly who he will have in tow but I'm sure it will be interesting and the perfect nightcap as St. Patrick's Day segues into Thursday. Be sure to check out BP's latest vibes and all his SX Music Week shows at his website and pick up one of the few remaining copies of his limited edition 2015 release for Saustex 'Live In Texas'. Closing the night will be young powerhouses Western Star. Given BP's long affiliation with Thin Lizzy and the Irish legends' influence on Western Star it seems the perfect one-two punch to end a singular night of soul and rock'n'roll. Coody Gold is not a name usually associated with Urban Music because few folks realize that he propelled BuckTooth's early career. The Amarillo-based music magnate discovered 'Tooth performing at the grand opening of a Texas Panhandle cell phone store called Bling Rings, and well, the rest is history. Now Gold has turned his attention to staging a tribute to his recently departed amigo Clarence Reid aka BLOWFLY during this year's SX Music Week. Not too many people know that Gold and Reid became fast friends at a Jai Alai match in Miami in the late 70's following Gold's debriefing and retirement from The Mossad after a particularly bloody incursion in Argentina. Operating with the stealth to be expected of a former secret agent Gold has assembled a star-studded lineup of performers from near and far to fete both sides of Reid's fifty year plus career in music. There is hitmaker Reid, architect of The Miami Sound and his alter-ego Blowfly - The Original Nasty Rapper. Both will get their due this night. Gold has also enlisted ample support from Texas boys who aren't afraid to drop an f-bomb or two. Blowfly fans might be especially interested in The Beaumonts. South Texas Popular Culture Center a.k.a. Tex Pop is proud to present a celebration of The San Antonio Sound to top off this year's SX Music Week on Saturday March 19th at ABGB in Austin, Texas. Headlining the event will be Rudy Tee Gonzales Y Los Pelicanos del Rey. Doors at 6:30 pm, Music at 7. All ages, no cover. As one of the major pioneers of Chicano rock'n'roll and later a successful Tejano singer, Rudy Tee Gonzales helped put San Antonio's famous Westside Sound on the map, inspiring everyone from Doug Sahm to ? and The Mysterians. In 1952, 14 year old Rudy Tee Gonzales started his own conjunto band in San Antonio, Conjunto Los Panchitos. However all that changed when he first heard Johnny Guitar Watson, Bobby Blue Bland and other national R&B acts. He immediately started a new band enlisting Big Ralph Sanchez (Big Ralph & The Gigolos) on sax, brother Red Gonzales on drums and others. By the late 1950's they cut some of the earliest Chicano rock and roll on small San Antonio labels. Many of these were written by Rudy, including "I Cry, Cry" (Rio Records), "Indian Rock" (Blaze Records) and "Morning Glory" (Red Top Records). 1961 brought their first big package show with Mexican performers playing at the Alameda Theatre in San Antonio. Now known as (Rudy &) The Reno Bops, Gonzales was recording for Renner Records, doing covers of popular R&B and Rock'n'Roll songs which Rudy had translated into Spanish including "Tossing & Turning" as "Vueltas y Vueltas" , "The Twist" as "El Twist", "Don't Cry No More" as "No Llores Mas". This act toured Texas, from SA to Corpus to Houston then off to California and on to the East Coast. Around this time Jesus Martinez and Los Teen Tops came to San Antonio for a show. Rudy and Los Teen Tops hit it off and Rudy found himself on a 30 hour train trip from San Antonio to Mexico City. He spent a few weeks down in Mexico playing bass and translating songs. Los Teen Tops wanted him to stay but Rudy was in the Army Reserves at the time and had to go back to SA. 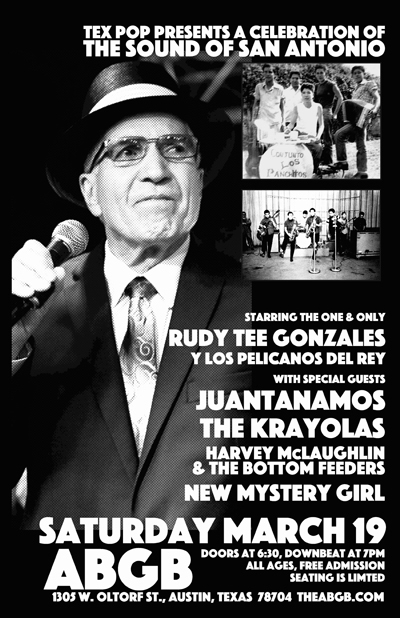 In 1965, Pato Gonzales was Rudy's promoter and booking agent. Pato along with wife Lily (owners of Bego Records) offered a deal to Rudy to co-own a new record label, soon dubbed Pa-Go-Go Records. The first act on the label was a little band out of Michigan called ? and The Mysterians. Their first release for Pa-Go-Go was "96 Tears" b/w "Midnight Hour", produced by Rudy. The label went on to release many other highly sought after 45's from 1965-1967. The intervening 35+ years would see Rudy Tee continue to perform, most notably as a Tejano singer until 2015 when he was invited to appear as a headliner at Ponderosa Stomp in New Orleans. Rudy and the Reno Bops performed to over 1,500 music fanatics playing songs from their catalog not touched since their original release on 45 RPM, sending the New Orleans crowd into a huge dance party and sparking a new interest in the sub-genre of Texas music known as the "Westside Sound". 2016 brings a special collaboration between Rudy and surf and twang killers King Pelican, performing material he hasn't done since the early 60's. The new act called Rudy Tee Gonzales Y Los Pelicanos del Rey captures the true sound and excitement of the era when Rudy was playing all over Texas, California and Mexico City. King Pelican has the big chops and driving beat to really showcase the raw energy of Rudy Tee, making this collaboration a must-see. Opening the evening's show will be Chrissy Flatt's New Mystery Girl. The San Antonio raised rocker has an upbeat and twangy sound that recalls 60's garage and girl groups and early American punk. Following NMG will be Harvey McLaughlin & The Bottom Feeders. The band infuses 50's and early 60's influenced rock'n'roll with 20-something energy and swagger. After Rudy T's set San Antonio veterans The Krayolas take the stage. The band now nearly forty years into a career that began in the mid-70's were once referred to as "The Beatles of Tex-Mex" because of their early harmony heavy, Fab Four influenced singles for Box Records. The band's mid-2000's revival has brought them new fans with a woodier, updated sound that relies more heavily on the incorporation of regional styles including blues and Tex-Mex. They are often heard on Little Steven's Garage on Sirius XM. Closing the night's festivities will be The Juantanamos, brainchild of guitarist and songwriter John Agather. The relatively new act draws very well in San Antonio with spotless presentation and music that brings The San Antonio Sound into the present within the AAA context. Expect special guests throughout the evening, this should be a night to remember. Tex Pop is THE Music Museum of San Antonio presenting exhibits centered on San Antonio's rich musical history, as well as live performances, film screenings and art and photography shows.